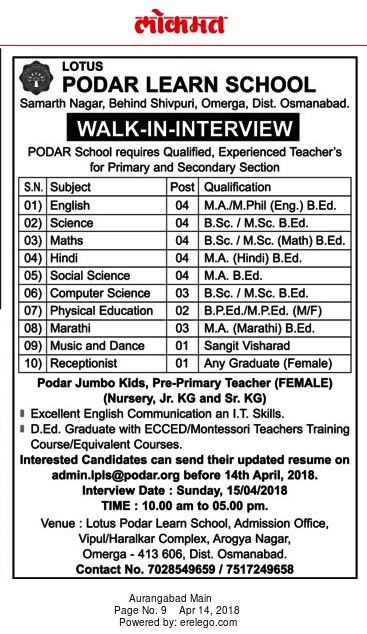 Lotus Podar Learn School, Osmanabad has advertised in THE LOKMAT newspaper for recruitment of Teachers jobs vacancies. Interested and eligible job aspirants are requested to apply on or before 14th April 2018.Check out further more details below. 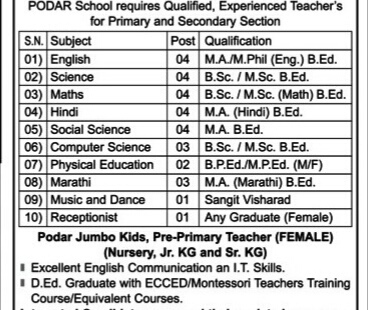 Name of the School: Lotus Podar Learn School, Osmanabad. About School: PODAR Curriculum Consultancy was born out of the ideology of extending academic support to schools beyond Podar International School with an explicitly designed curriculum that focuses on augmenting the quality of ICSE and CBSE schools across the country. According to Mahatma Gandhi, “By education, I mean an all-round drawing of the best in child and man in body, mind and spirit.” We strongly believe in the essence of this statement. Our vision is to be the epitome of excellent, stimulating, trusted and safe learning environments embedded in Indian values while creating independent thinkers who spearhead a dynamic future globally. (b) D.Ed. Graduate with ECCED/Montessori Teachers Training course/Equivalent Courses. 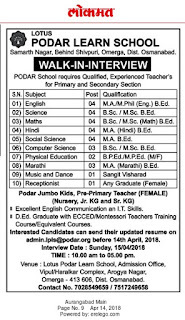 How to Apply: Interested Candidates can send their updated resume on admin.lpls@podar.org before 14th april 2018. Vipul/Haralkar Complex, Arogya nagar,Omerga Dt, Osmanabad.